In 1899, Augustus Henry Glissan, the manager of Rocklands Station, near Camooweal in far North Queensland, posted a small blue-lined notebook to family friend Charles Bage, a medical practitioner in Melbourne. Inscribed on the book's front cover were the words 'Drawn by Oscar, Cooktown boy, aged 18 years'. At some time Bage must have passed the book on to his colleague Sir Colin MacKenzie, whose collection was to become the nucleus of the Australian Institute of Anatomy. In the early 1990s, nearly 100 years since it had left Rocklands, Oscar's sketchbook was rediscovered by National Museum of Australia staff. Thus, by a series of fortuitous links, this seemingly insignificant little notebook produced in remote Australia at the end of the nineteenth century, had been kept and passed on. 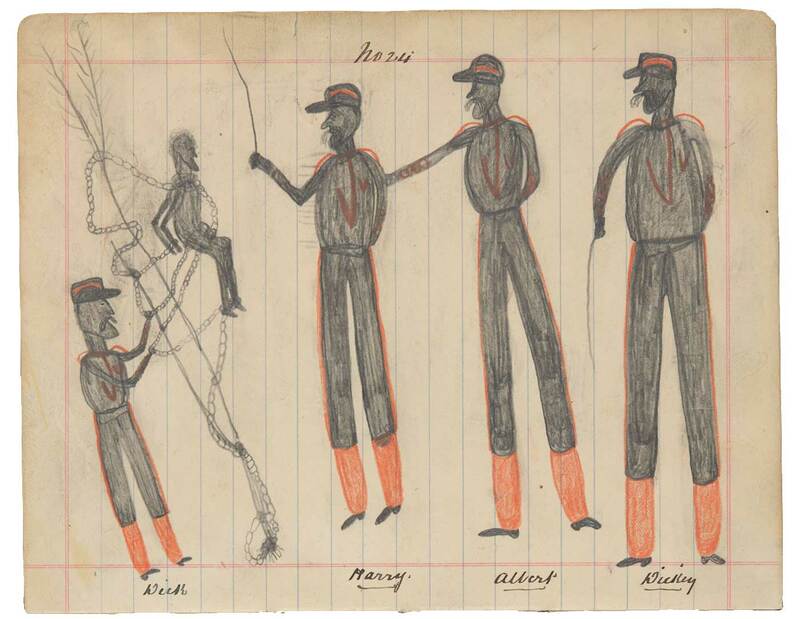 As a result, the set of 40 pencil drawings, which are the only identified works of the nineteenth-century Aboriginal artist known as 'Oscar', have been preserved in the collection of the National Museum of Australia. Glissan obtained Oscar in 1887 from the police at Cooktown, when Oscar was about nine or ten years old. The police brought him by steamer to the Gulf of Carpentaria where he was given to Glissan, who took him on the long return journey to Rocklands on horseback. Ever since the boy came here he has had a liking for drawing & some of his etchings on stone with charcoal and chalk are so really well done, that I thought some day I would get him a book and some coloured pencils & let him have a good try at it. Glissan added an index to the sketchbook which gives titles to all the sketches, briefly describing and locating them. The drawings appear to present an autobiographical account of Oscar's life. Nearly half are concerned with the Palmer River goldfields area around Maytown and Cooktown. The drawings depict both the traditional life of the Indigenous tribesmen, especially ceremonies and fight scenes, and the interchange between Aboriginal, European and Chinese cultures. Palmer River Govt Officials is a lively caricature of mining wardens pursuing Chinese miners. Oscar's sense of humour is shown in similar drawings such as Some Cooktown Swells. The remaining drawings illustrate aspects of Oscar's life at Rocklands. This series includes graphic depictions of the brutality of the Queensland Native Police Force, such as Murderer Hoppled to Tree. Troopers dispatching. Only one drawing refers to Oscar's working life and, significantly, Boss Ordering Boys to Bathe (Cold Weather) contains images of both Oscar and Glissan. Oscar is probably the small figure at the end of the line of 'boys' while the 'boss' is undoubtedly Gus Glissan. Photographs taken in the 1890s show that Glissan was tall and solid, with a luxuriant moustache. Oscar's life was perhaps typical for his time and place. The disruptions and violence caused to traditional Indigenous life by the Palmer River gold rush in 1873 led to dispossession from his tribal lands, either by being orphaned or stolen from his family. Obtained by Glissan as a 'boy' or stockman, Oscar was forced to adapt to a completely different way of life. What is unique in Oscar's story is that he was encouraged to tell his life in drawings, and equally remarkable is the fact that his small volume has been preserved.